Silverchair’s third single from Young Modern, If You Keep Losing Sleep, was transformed into a horror-style music video in Melbourne in July this year, premiering on Channel Seven’s Sunrise program on August 28. 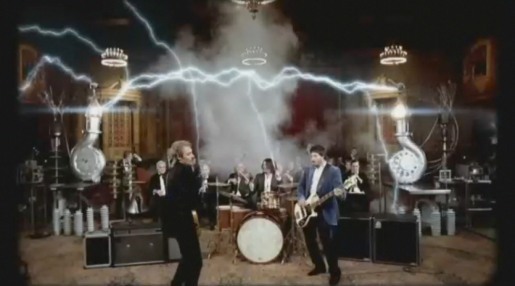 The recurring motif throughout the video is arced electricity – in the form of lightning. Each time the electricity arcs the video morphs, introducing new elements: first the heads of Silverchair members, a young ballerina, the band in performance, an orchestra, dancing girls, a band of drummers. Finally the hallucinatory performers march out of the picture. Filming was shot by Damon Escott and Stephen Lance of Head Pictures, Brisbane, with producer Leanne Tonkes, via The Guild of Commercial Filmmakers, Melbourne. Visual effects were developed at Liquid VFX, Brisbane. Editor was Haley Stibbard. Escott & Lance describe the clip as “Busby Berkley meets Frankenstein. A demented toy box of broadway horror”.